If there was one defining moment to memorialize what might be the tournament that solidifies Lionel Messi's place as the greatest soccer player of all time, it was the few seconds after he scored the game-winning goal in Argentina's first group stage match. The shot itself was a sign of what was to come—not just the multiple goals he's scored throughout the tournament, but the late, crucial moments of inspiration that have rescued a team with little attacking fluency. The celebration, though, revealed more than just the happiness of winning. It evinced the enormous boulder placed squarely on his back, and his alone. That galloping, screaming, shirt-flapping, fist-pumping explosion of joy was a rare view of the inner value system of Lionel Messi. There have been any number of exegeses imagining the man behind Messi's eyes, which are always transfixed on the ball. The most famous of these is probably " Messi es un perro" (translated here) by Hernán Casciari. In it, Casciari describes Messi as a man-dog, a being singularly fixated on getting the ball and putting it into the net. Nothing else is of any concern, because nothing else makes him as happy. Going off of what little we know of the Argentine, this description appears apt. We're pretty much forced into this conclusion because, for as much of a commercial entity as Lionel Messi is—he pulls in more than $20M annually from endorsements—he remains a black box. He gives us so little of himself in those commercials, in the press, or on social media that the only text we have to analyze him by is what we see on the pitch. This is different from pretty much every other superstar in soccer. Cristiano Ronaldo is defined at least as much by his magazine covers, his enjoyment of the nightlife scene, and his rotating cast of arm candy as he is by his blurring speed and ridiculous goal-scoring. Yes, Wayne Rooney is the best Englishman of his generation, but his alternatively receding and advancing hairline, plus all of his tabloid exploits, are a huge part of how we think about him. Neymar is one of those modern #brand athletes who is active on social media, but the only real impression of him you get is that he is a genuinely good kid with a very involved marketing team adamant on pushing the "Neymar is a good kid" image. There is practically none of that from Messi. He is active on Facebook and Instagram, but his generic messages are the sort that any marketing intern could concoct without much thought. A picture with his teammates, accompanied with "We're all really excited for today's game!" A picture from the pitch with the opponent he swapped shirts with saying "It was a great game, really nice to catch up with Fernando!" Bland, inoffensive content done out of obligation rather than real engagement. Where the agents and various managers of star players in every sport would be quick to combat these rumors and allegations to protect their client's reputation, not to mention innundate us with the feel-good stories to paint a saintly image, there are no such edicts in Messi's world. It really does seem like he doesn't care. There are still things that do matter to Lionel Messi, of course. His fingers to the sky celebration in remembrance of his grandmother, along with the closeness of his family, show that that is of chief import to him, obviously. As Casciari's essay gets at, and the video above that in part inspired it, he takes great joy in the simple pleasure of playing soccer. And alongside all of that, there is his passion for his homeland, the one great love of his life that has not returned his adoration with equal fervor. For as many "what makes Messi tick" stories as we've gotten, there have to have been just as many words spilled on Argentina's ambivalent relationship with their prodigal son. The story goes that since Messi left at such an early age—he moved to Barcelona at 13—and didn't shine for one of the local teams, Argentines felt no kinship toward him. Couple that with relatively disappointing national team performances, and that he couldn't replicate his dominance in Spain for his country, Argentina was fine with the narrative that he didn't care about the albiceleste and was more Catalan than Argentine, anyway. None of that was true, of course. Messi has clung to his Argentine accent. He shot down Spain's repeated attempts to represent La Roja internationally, never countenancing the idea of playing for anyone but Argentina. He even flies in the specific Argentine meat he prefers to Barcelona. Most tellingly, Leo was so distraught by not being accepted by his fellow countrymen after the debacle in the 2011 Copa América, hosted by Argentina that he considered retiring from the national team. In his own mind, he was distinctly Argentine, yet according to them, he was anything but. Messi's only chance to win over Argentina was on the international stage. A combination of poor man management (many of his teammates in the 2006 and even 2010 editions repeatedly denied his big homie status and insisted on lil' broing him) and insane team management (Diego Maradona: Argentina national team manager?!) meant he never had an honest opportunity to perform in the World Cup in the dominant fashion demanded of him. Much of the indifference towards Messi in Argentina and within the Argentina national team has—as exhausting as the mythology around this has become—been because of the shadow of Diego Maradona. Jealousy of the true "Next Maradona" surely soured Messi's relationship with Juan Román Riquelme and other teammates in 2006. Maradona's own insecurities about his former greatness—and the talent of one of his charges that some considered to have surpassed his own—probably lead to some of the criticism he heaped on Messi after the 2010 crash out. Even now, simply performing well while in the white and sky blue isn't enough. To truly erase the memory of El Diez, he had to replicate his predecessor's greatest performance: the 1986 World Cup title he almost single-handedly willed the country to. Luckily for Argentina's current No. 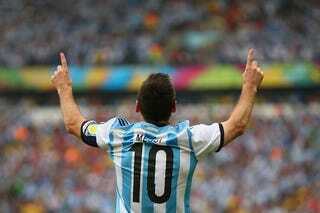 10, that's exactly what Messi has been doing in Brazil this summer. In a tournament defined by great players doing what only they can, he has been the most consistent deliverer of individual brilliance. On paper, Argentina are a team with an unbelievable forward line supported by mediocre-to-good battery mates. In reality, Sergio Agüero has been injured, Gonzalo Higuaín largely anonymous, Ángel di María great but wasteful and now is also injured, and the mediocre-to-good teammates have lived up to their billing. Playing like that doesn't exactly spring you into attack, which is part of why the Dutch could only manage one shot on target. In attack, Messi exerts his influence more directly. As the team's chief scoring threat, he has scored four times in six matches, only two behind World Cup leader James Rodríguez and fully half of Argentina's goals. He has only one assist, but his 21 chances created are the most in the field. Since so much attention is focused on him—to little effect, given his Cup-leading 39 successful take-ons—it opens up the space for the rest of team to make something happen themselves or, more likely, lighten Messi's load for a touch or two before returning the ball right back to him. It may not involve the flash and flair of Maradona's iconic performances, but it's nonetheless evident to all that Messi, in Maradona's colors, with Maradona's number, and with Maradona's all-encompassing dominance, that he has been the sole reason Argentina find themselves in the final. For all those reasons, Leo is finally getting the recognition at home that he deserves. All the other great loves in Messi's life have returned the gesture in kind. Like most families, I'm sure the love on that front is unconditional. As much as he loves the ball, the ball must love him just as much, seeing that he's the only one who can coax it into doing the things it does for him. And now, after so much heartache and pressure and negativity, Argentina is returning the favor. Argentina will go into Sunday's final against Germany as the firm underdog, but that won't scare the Argentine faithful sure to pack the Maracanã in support of the team. They'll have each other, and they'll have their Messi, maybe the greatest Argentine player of them all. Here's another angle of that opening Messi goal, this time from the stands. As we see the Argentine realizing what he had done and tear off toward the corner flag, the camera cuts to the crowd. There is a sea of albiceleste, jumping, flailing their arms, hollering in admiration for their star player and idol. In those images you see happiness, and you also see acceptance.